I am so glad I gave this title another shot. I initially attempted to read this in March 2012 and only got about 3% of the way through before I abandoned ship so to speak and refused to read another syllable. The opening chapters of the book describe of an expedition to plunder Titanic using divers, not submersibles. 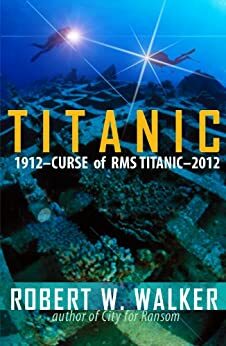 At the time, and not reading any further than the first few chapters, I was insulted that the author would think his readers so unintelligent to not know that at the depths that Titanic rests, this concept is pretty much impossible. I reviewed what I read on Goodreads, gave it one star and moved on. Fast forward to February 2013 and I decided to give this book another shot. Being a life-long Titanic fan, I consider myself a bit of an aficionado on the subject (maybe not as thorough as Declan, but pretty close! ), and since this book is set with Titanic as the back drop I figured I owed it another look. I planned on going in with the mindset that this should be treated as more science fiction than anything else, but I was on the lookout for any glaring factual errors. After rereading this book, I must say I really liked it. The way the author tells the story both in 1912 and 2012 reminded me of Ann Benson’s, “The Plague Tales”, and despite what I have read in other reviews both “eras” were equally enjoyable and the story was not at all hard to follow. The book as a whole was long but I only found it a bit too technical and wordy during the full description of the Max submersible. Truly, this section had my eyes crossing and my head hurting by the time I was through reading it! It seemed to be descriptive more for descriptions sake and less to advance the story. (Of course it also may have had something to do with the fact that I was reading this chapter at roughly 3 A.M. while I was feeding my daughter.) That section could probably have been trimmed down; however, I did not have that issue with the rest of the text. The history of Titanic overall was very good and the way the story evolved around her, from the shipyard to the maiden voyage, was very well done, with a few exceptions. Throughout the story, I did encounter a few typical grammar errors; a misplaced apostrophe here, misspelled word there and a few instances where the word used did not make much sense with the context of the sentence. Seeing as how this is an eBook primarily, those are fairly easy fixes. Throughout my reading, I also used my notes and highlights feature on my Kindle to keep track of my thoughts as well as research what I was reading via Google searches. (I did this less for my learning anything and more for my testing the authenticity of the author.) Throughout this process, I learned that the underwater breathing technology and deep water diving is not as far-fetched as I had deemed last March. We are not “there” yet, but the technology definitely exists and is being developed. Of course the “Declan” in me, did find a few historical errors as well, and while they weren’t bad enough for me to throw up my hands and stop reading again (much like I stopped watching James Cameron’s Titanic the first time I saw it), I still feel that they should be mentioned. 1) For the first half of the book, I seem to remember the order of the Olympic class ships to be reversed. They were launched with Olympic, then Titanic and Britannic, not Britannic, Titanic, Olympic. This fact was corrected later in the story. 2) In one part the date of the sinking was noted as April 12, 1912. This was only referenced once in the story with all other mentions being the correct April 14th date. 3) On a few occasions, Mr. Walker refers to the temperature of the sea on the night of her sinking as “a little under 50 degrees”. It has been documented that the waters of the North Atlantic that night was actually 28 degrees. 4) According to the Titanic cargo manifest, there was never a Mummy on board. This appears to be a myth. Actually, I’m impressed that this was only time that the author got his time frames confused due to all of the back and forth. So, am I glad I gave this book another try? You bet I am, and I have to admit I was pretty much “out for” hating this book all over again when I first started reading it, but the more I read the more Robert Walker’s story of Titanic won me over. In fact, I would consider this as one of very few books that I could see myself rereading again down the line just to relive the story.